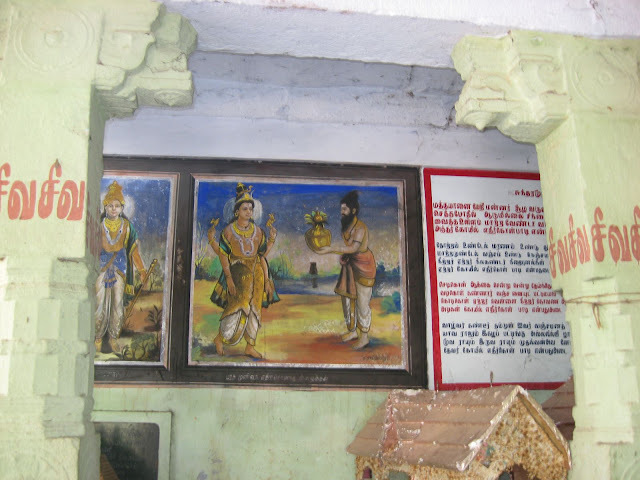 Diwali Tour Part 11 – Thirumanancheri and surrounding temples related to the marriage of Shiva and Parvati. The stories of Shiva and Parvati’s marriage have all the ingredients of a first class romance – from the story of the beautiful Sati’s marriage to the lord of the world living in a cemetery, to their subsequent dramatic parting; her re-birth as Parvati, and her strong resolve to marry the man who wouldn’t even look at her; her standing up to him and proving her worth, and finally getting her wish; their subsequent tiffs leading to her advent on earth (her mother’s home) every now and then, and Shiva finally making up to her by arriving to get married again – every story is interesting and has been told and retold in various ways ever since. 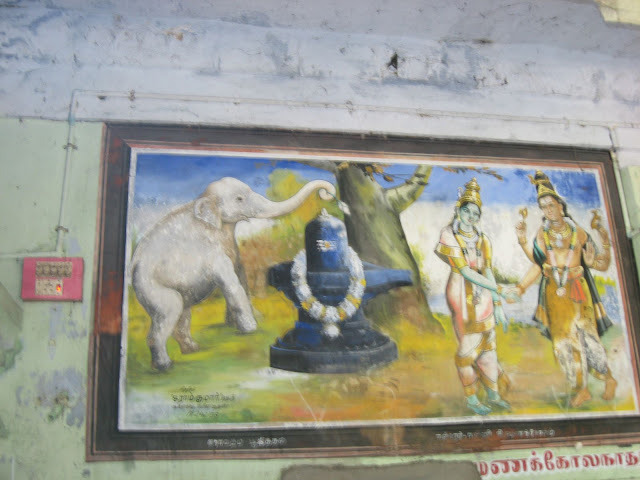 Many places linked to Shiva and Parvati’s marriage have temples dedicated to the divine wedding, Madurai and Thirumanancheri being the most popular among them. While it was Meenakshi, the daughter of the Pandya king that Shiva as Sundareswarar (the handsome one) married at Madurai, in Thirumanancheri, Parvati was born as a daughter of a rishi. According to the legend, Shiva was once angry with Parvati and cursed her to be born as a cow. When she pleaded with him, he assured her that her brother (Vishnu) would arrive to help her reunite with Shiva. Accordingly, she was born as a cow at Thiruvavadudurai, where she spent her time offering her milk to Shiva and praying to him. In due course, Vishnu arrived as a cowherd and met Parvati at Therazhundur. She finally attained a female form at Thiruvavadudurai, and was accepted as a daughter by Bharatha Maharshi she grew up as Bharatha Maharshi’s daughter at Thiruthurutthi (Kuttalam). When she was of marriageable age, Shiva arrived to marry her, and was received by the sage at Ethirkolpadi. He performed the Vratham (rites before marriage) at Velvikudi, and finally the marriage itself took place at Thirumanancheri. The divine couple left for their abode from the bride’s home at Thiruthurutthi. At all these 6 places, there are big temples dedicated to Shiva and Parvati and these are collectively known as the “Kalyana Sthalams”. 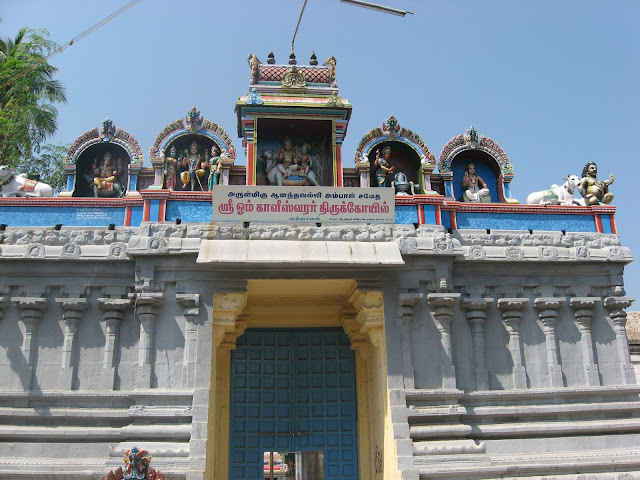 All these temples are situated around Thirumanancheri within a radius of about 10Kms. There are also other temples in the vicinity, where the various gods who arrived for the wedding paid their respects to the divine couple. Let us take a tour of these temples. Once upon a time, the king Oordavaradan’s chariot wheel got stuck in the mud at this place, giving it the name “Therazhundur” (Ther- Chariot; Azhundu- get stuck). However, the temple here goes back to time even before that, for this is the place where Vishnu, as a cowherd met his sister Parvati, who, due to her husband’s curse was living in the guise of a cow. 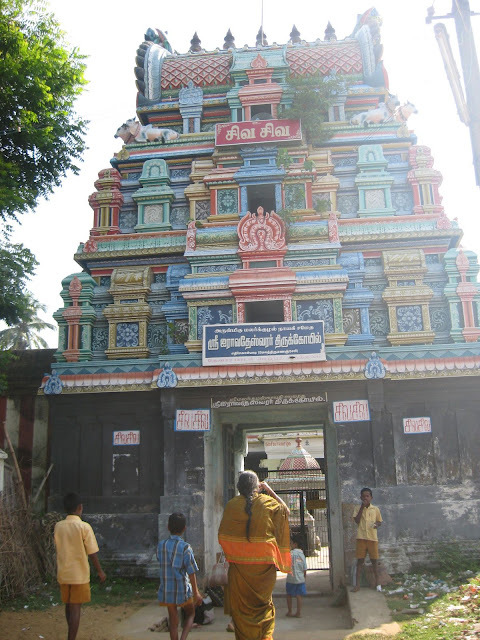 The main deity in this temple is Vedapureeswarar and his consort is Soundaryanayaki. 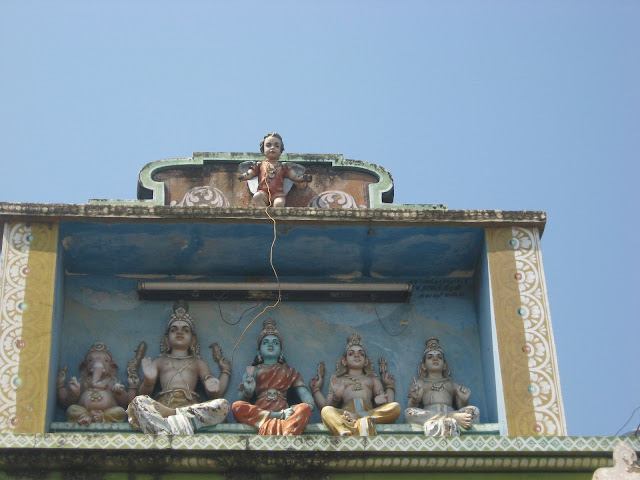 This village is more popular for its Vaishnava temple – the Amaruviyappar temple, which is one of the 108 Divya Desams. While the Shiva temple is practically in shambles, the Vishnu temple is currently being renovated, and is visited by a number of people. We had a lot of trouble finding this temple, for everyone seemed to have only heard of the Vishnu temple. We had to ask a number of people before one finally directed us towards the Shiva temple. 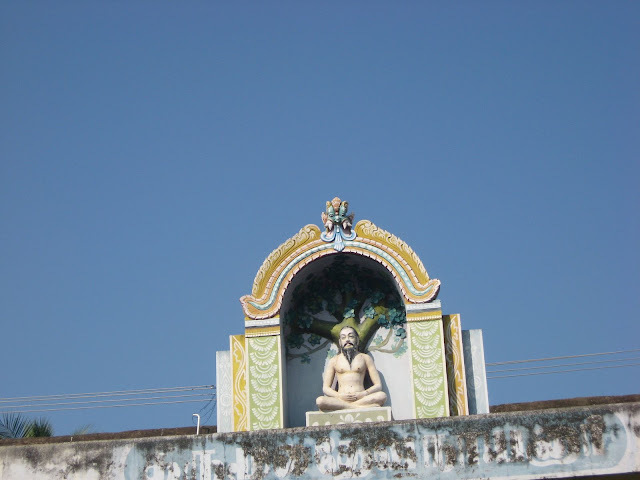 Therazhundur is about 2 Kms from Kumbakonam on the Mayiladudurai road, near Thirumanancheri and about 11 Kms from Mayiladudurai. 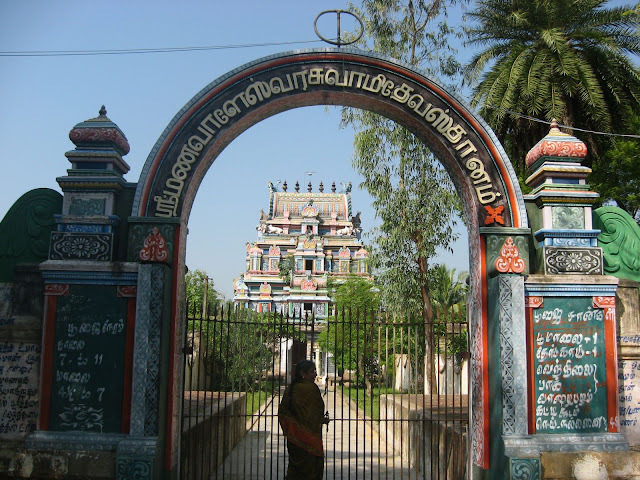 Thiruvavadudurai is home to the Thiruvavadudurai Adheenam, the Shiva Mutt which manages a number of charitable endowments and is responsible for preservation of many Shiva temples. It is thanks to this mutt that a number of Shiva temples in this area are still standing tall and have priests to perform the regular puja. We visited a number of temples belonging to the Adheenam, and were pleasantly surprised at the wonderful job they were doing in managing so many temples. 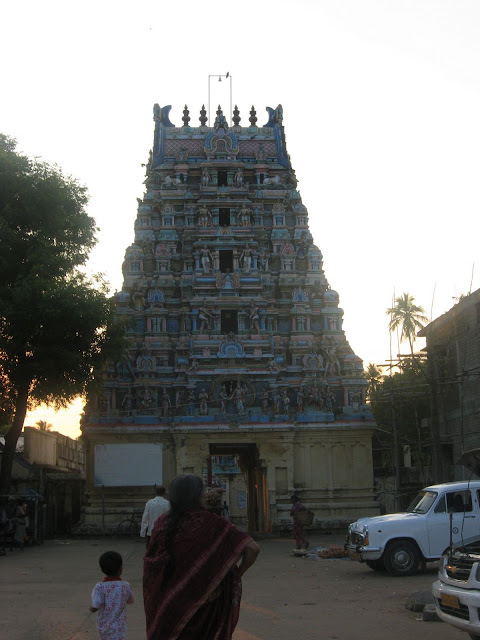 Shiva is believed to have blessed the saint Thirumoolar at this temple, where the saint finally attained Samadhi. The saint’s Samadhi within the outer pragaram of the temple is a quiet and peaceful place. Ask the priest for a lamp, light it in the Samadhi and sit there quietly for a few minutes. It is a wonderful feeling that must be experienced first hand. 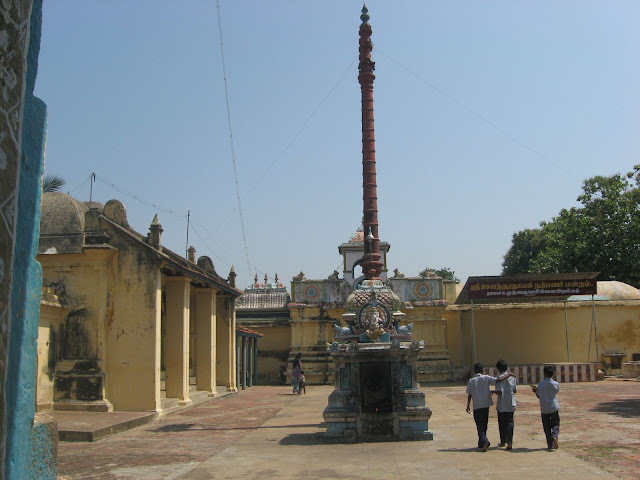 Thiruvavadudurai is about 2 Kms from Narasingampettai, which is about 16 Kms from Kumbakonam on the Mayiladudurai road. The place where Parvati grew to adulthood as Bharatha Maharshi’s daughter is within the town of Kuttalam. Kuttalam itself has a number of temples, and this one is known as the Ukthavedeeswarar temple. Very few people know of the name ‘Thiruthurutthi’, which is the ancient name of the place. 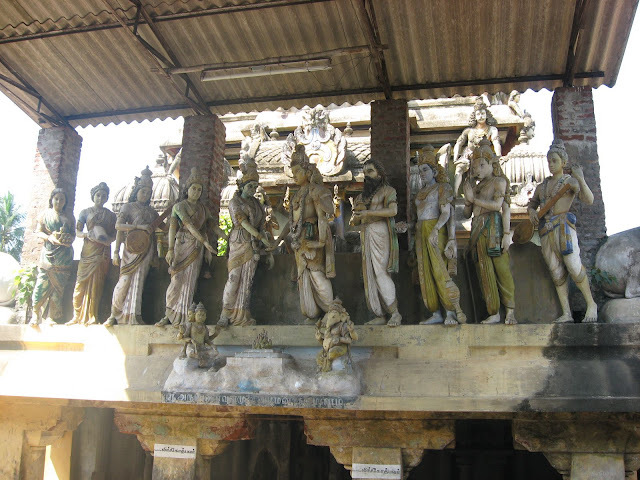 The main deities in this temple are Ukthavedeeswarar and Parimala Sugandha Nayaki. It is believed that Shiva arrived here for the marriage and the couple also departed from this place. 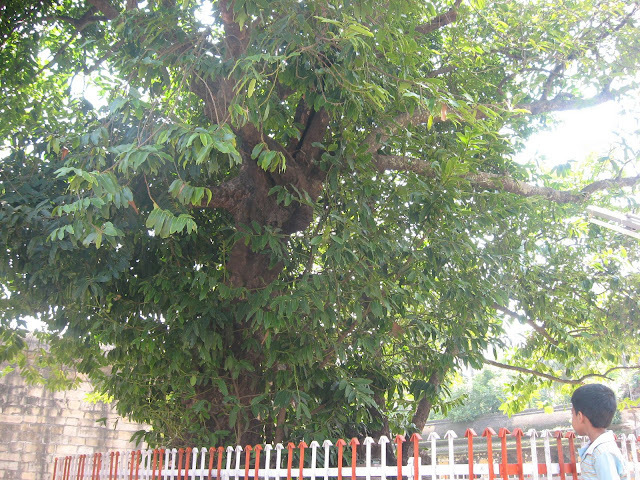 The sthala vriksham here is the Kuttalam tree, which is believed to have been brought from Kailas when Shiva arrived for the wedding. 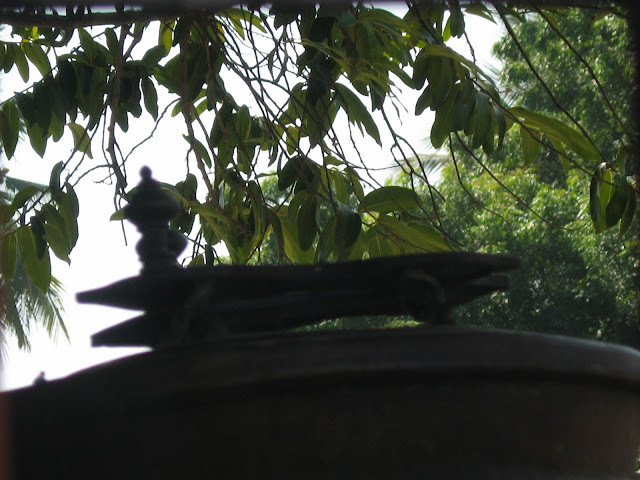 Under the tree is a pair of Padukas, believed to be those of Shiva, which he left behind when he left his father-in-law’s place with his wife. 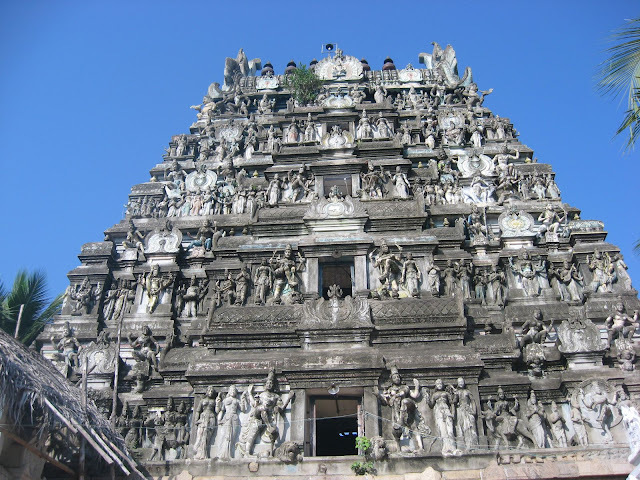 This is a beautiful temple, with exquisite work on the gopurams. 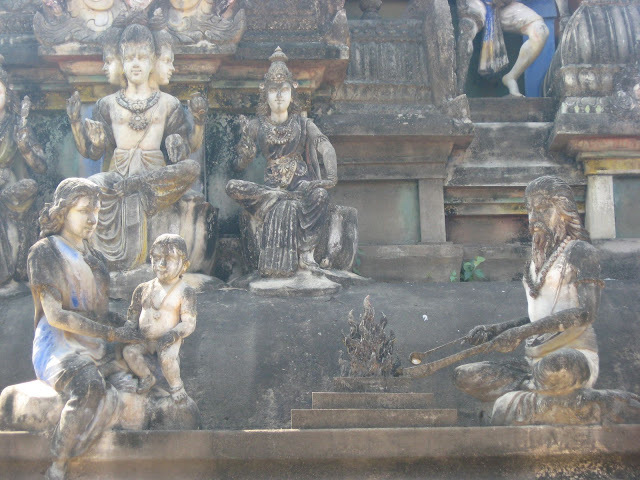 While one façade of the gopuram depicted the child Parvati with her foster parents – the rishi and his wife, another depicted the marriage, while another showed various forms of Dakshinamoorthy. There was also one of Parvati praying to a lingam. Here are a few of these photos. 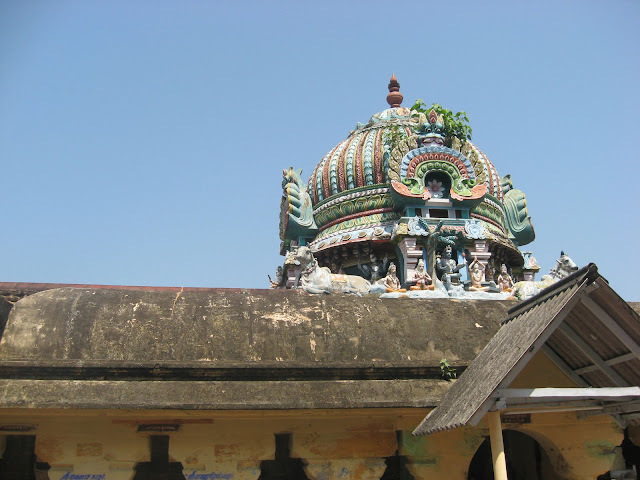 Thiruthurutthi is about 26 Kms from Kumbakonam on the Mayiladudurai road, in the town of Kuttalam. 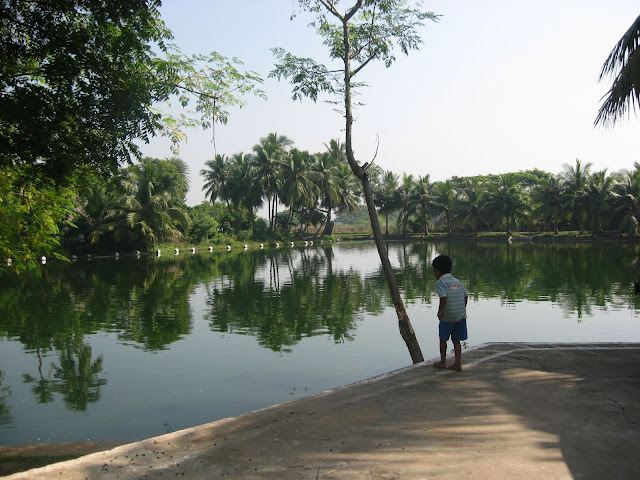 Ethirkolpadi is where Shiva was received by Bharatha Maharshi with the Poornakumbham, when he arrived for the marriage. However, this place has an earlier legend too, according to which, Airavata, the white elephant of Indra prayed to Shiva at this place. 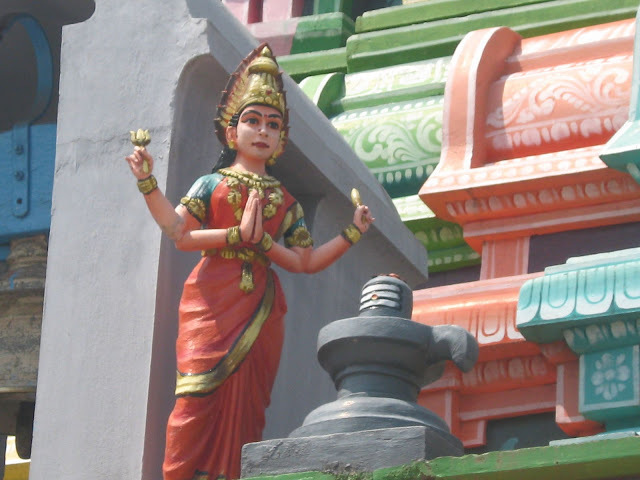 Hence, the main deity is called Airavateswarar and his consort is Malar Koozhal Nayaki. This is actually a very beautiful temple, though it needs better maintenance. As it is, the temple looks a little old and the pragaram is overgrown with trees and flowering plants, making it look beautiful. I wish whoever is in-charge of the temple would do a bit of renovation and leave the surroundings as it is. Ethirkolpadi is very near Thirumanancheri. In fact, there is a board indicating this temple just before we reach the Thirumanancheri temple. 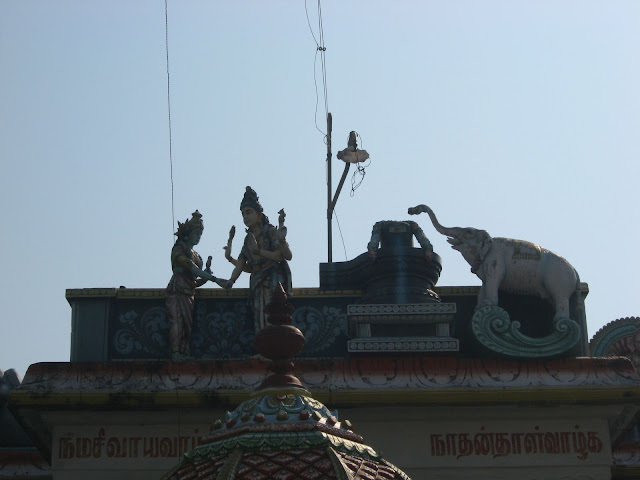 Velvikudi or Thiruvelvikudi is where Shiva performed the Vratham – rites before marriage. 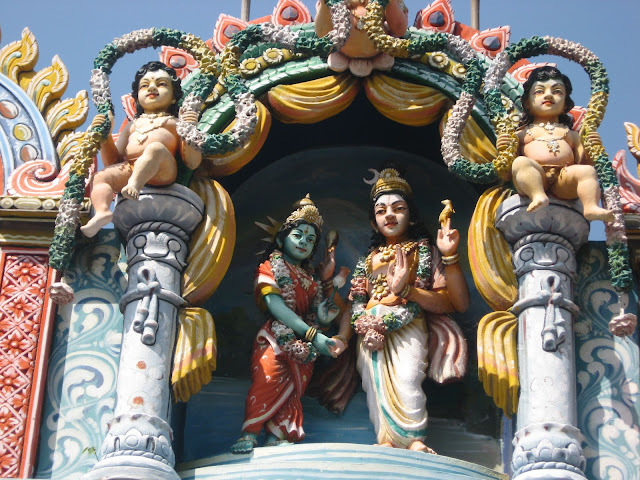 Since the early homams were performed by the divine couple at this place, it is considered beneficial to perform homams here for early marriage. The prayers and rituals are similar to those carried out at Thirumanancheri, except that some special homams are performed on every full moon day, and those whose marriages are delayed are advised to participate. 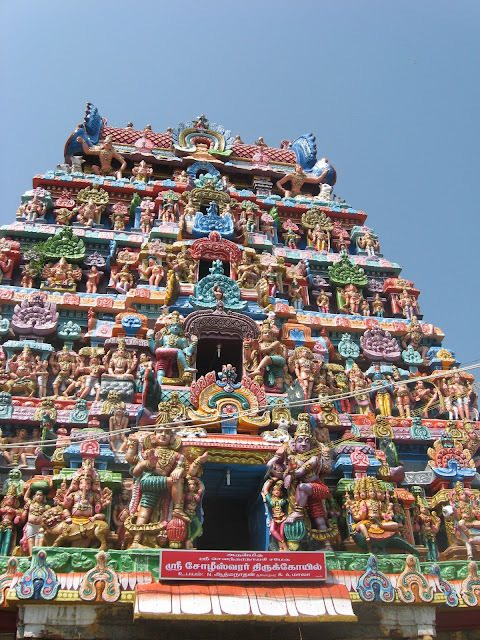 The main deities in this temple are Mana Valeswarar and Parimala Sugandha Nayaki. Velvikudi is about 5 Kms from Kuttalam. Thirumanancheri is where the divine marriage of Shiva and Parvati took place, and today, people flock to this temple, praying for an early marriage, thanking the lord for their marriage, and praying for children. The temple is crowded at all times of the year, showing the importance of marriage in our community. One is supposed to offer special prayers to the lord, after which we are given the garlands worn by the god and goddess. We are supposed to keep this carefully till we get married, and then after the marriage, come back to the temple with one’s spouse, wearing the same garlands, and once again offer prayers as thanksgiving. When I first heard these complicated rules, I wondered if marriage was so important after all! (I was unmarried then, and my mother, though rather desperate, didn’t go to this extent, for which I am thankful to her). Anyway, I did go to the temple this time with my husband, and prayed to the lord for our wellbeing, though abstaining from any elaborate rituals. There was no electricity when we visited this temple, and devotees thronged the outer waiting halls, waiting for the current to re-appear, so that they could have darshan and perform their rituals. We however, did not have the luxury of time, and elected to have darshan in the light of the deeparadhana itself. This in itself was a wonderful experience, the figures of the lord groomed in his best for his wedding, and the goddess, shy as a bride, standing out clearly in the light thrown by the feeble oil lamp. 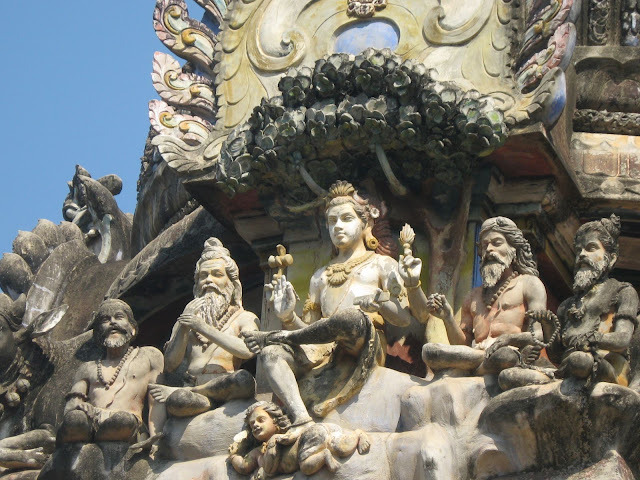 However, I must visit this temple again to see the deities in better light! 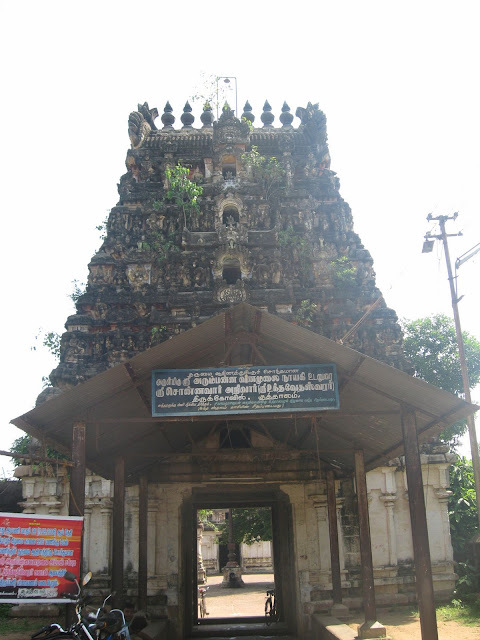 Thirumanancheri is about 6 Kms from Kuttalam, and about 12 Kms from Kanjanur. These are the main temples related to the divine marriage. However, there are a few more temples in the vicinity, where, it is believed, the divine invitees to this wedding offered their respects to the bride and groom. 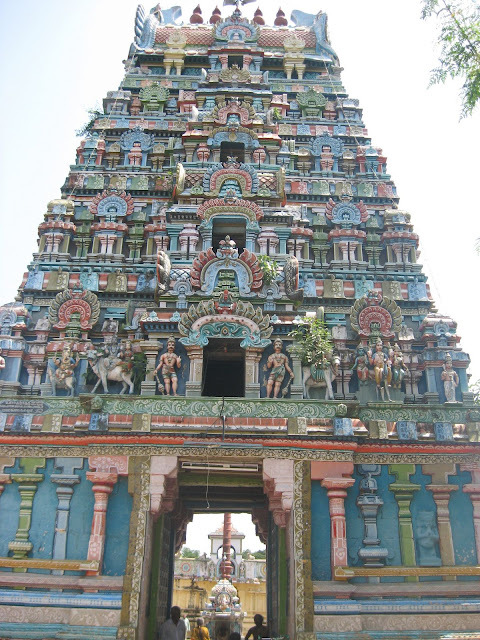 All these temples are in the town of Kuttalam, about 26 Kms from Kumbakonam on the road to Mayiladudurai. The first of these temples is the Choleeswarar Temple, where, it is believed that Agni, the lord of fire, prayed to Shiva, when he arrived for the wedding. 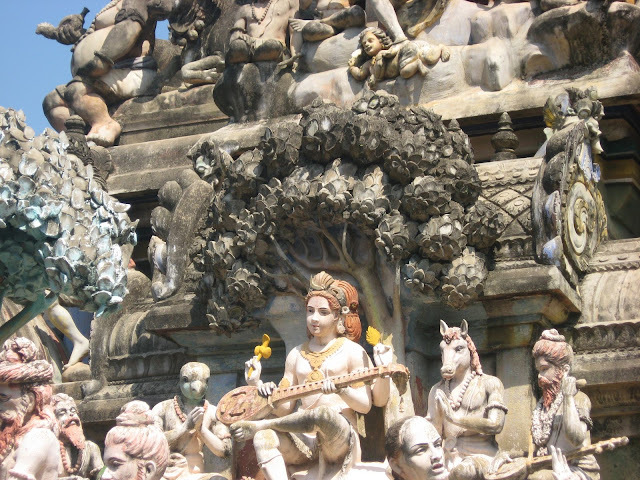 The main deity in this temple is Choleeswarar, and his consort is Soundaryanayaki. An interesting thing about this temple is the presence of a small shrine to Shani, slightly under ground level. This idol of Shaneeswarar is believed to be a swayambhu, and he is called Patala Shaneeswarar. The next temple is the OmKaleeswarar Temple, where, it is believed, Kali arrived for the wedding, and offered her prayers to Shiva. Shiva blessed her, adding her name to his in this temple. 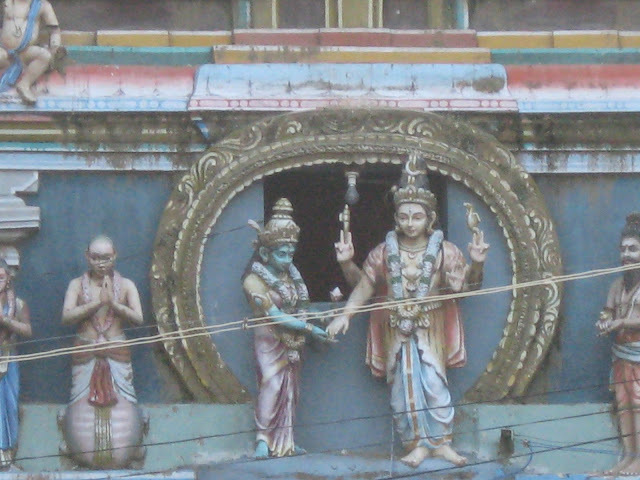 Thus, the main deity is Omkaleeswarar and his consort is Anandavalli. 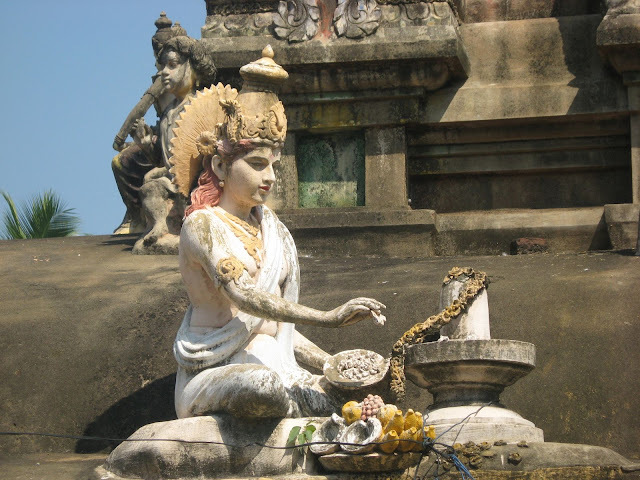 It is believed that Kali circumambulated Shiva here in a particular way, and it is considered auspicious to perform pradakshina the same way even today. 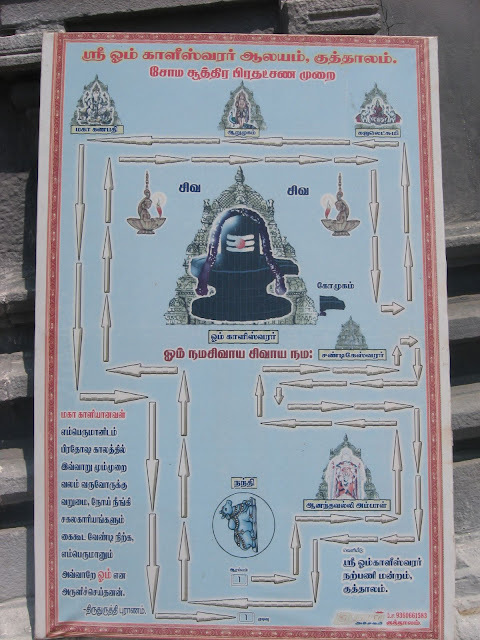 There is a board outside the sanctum informing us of this practice and showing the right method of circumambulation. 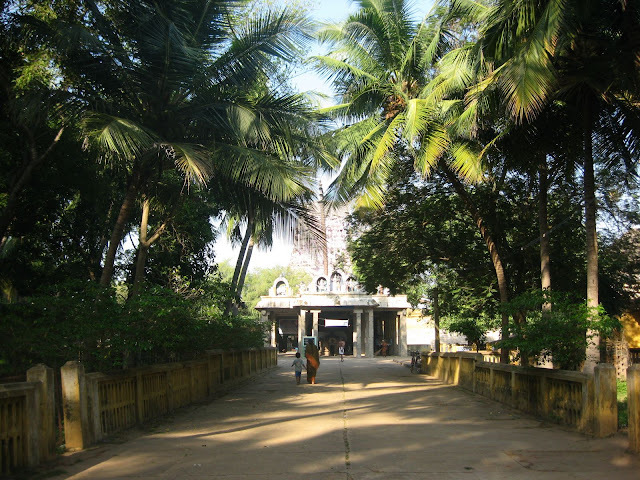 The third one is the Manmatheeswarar Temple, where, it is believed, Manmatha, the god of love, prayed to Shiva. Incidentally, this area is connected with the burning of Kama / Manmatha by Shiva, and his being brought back to life during the divine marriage. 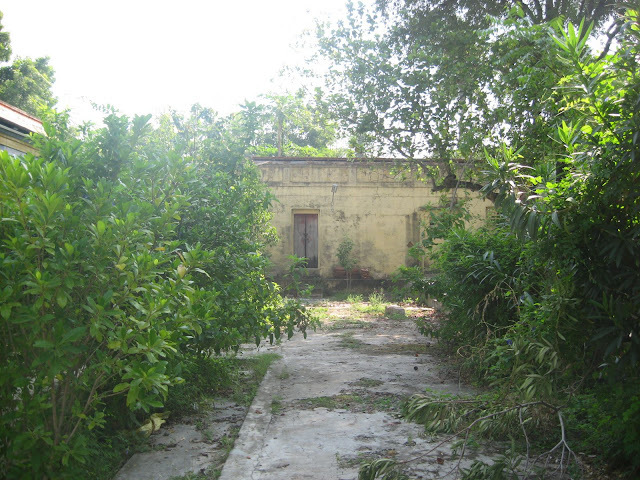 There is another temple near Mayiladudurai, where Kama is believed to have been burnt. The history of the temple is also interesting. It is believed that when this place was being dug for some building purpose, a lingam was seen. 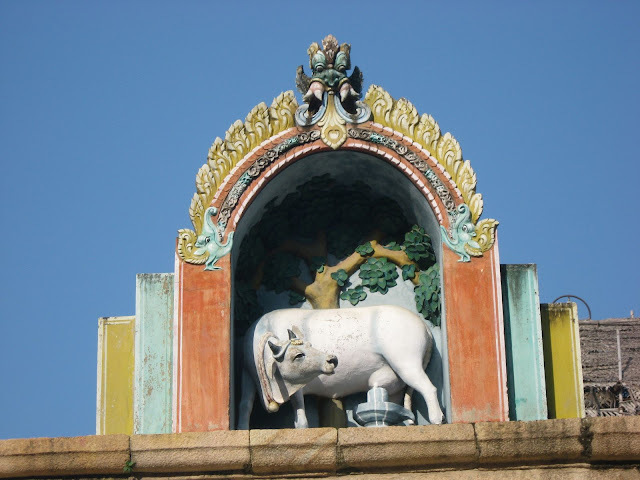 The king ordered that a temple should be built over the lingam. So, work on the temple started even as the lingam was being excavated. Finally, as it turned out, the lingam, or rather, the avudayar was so huge; it filled the entire space allotted for the sanctum! The priest allowed us to approach the sanctum, and it was amazing to see that there was hardly any place to move around, the lingam occupied the whole space! 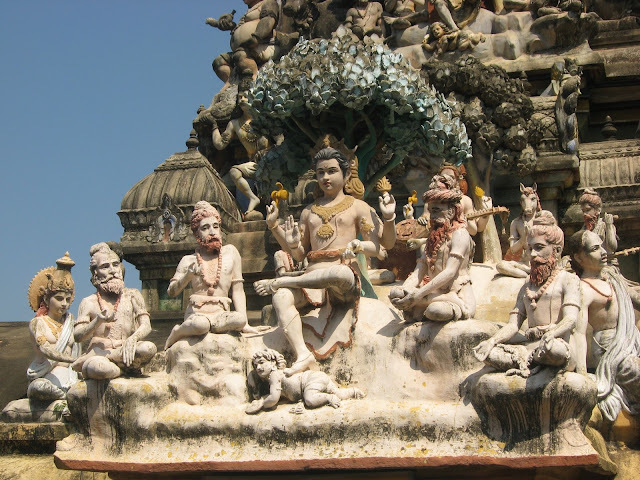 An interesting thing about this temple is the statue on top of the main entranceway – it depicts Shiva and his family along with another member – Chandikeswarar. There are two other temples in Kuttalam itself which come in this group. These are the Sundareswarar Temple and Omkareswarar Temple. We were unable to visit these two temples, due to lack of time, and hence I cannot give any more details about them. The best way to cover all these temples is to take a car from Kumbakonam, as there are more drivers with detailed knowledge of temples there. It will, at max, take about 5 hours, thus one can visit all the temples before they close at lunchtime if you start early in the morning. Your blog is so detailed that it acts as a reference for any traveller. But i wud suggest you break such long posts into 2-3 posts for easy assimilation.